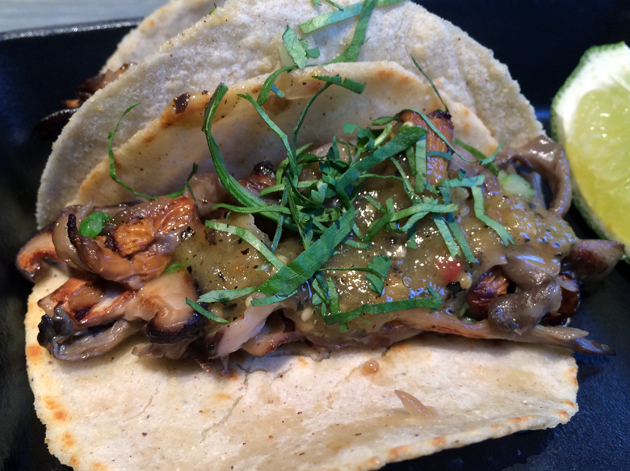 Peyote vs Breddo’s Tacos review – Mayfair Mexican miracle or middling muddle? Breddo’s Tacos was one of the very few Mexican eateries that I managed to miss during my recent round-up of London’s burrito and taco eateries. I finally got off my arse and tasted the market stall’s wares (also currently available at The Player), while also trying the Mexican food from an altogether very different eatery – Mayfair restaurant Peyote. This therefore isn’t a traditional ‘vs’ review as the two are very different indeed, but it was still fascinating to see two contrasting approaches to Mexican food. A lot of Mexican restaurants have awful kitschy decor, but the downstairs dining room at Peyote couldn’t be more different. The muted, inoffensive beige tones is livened up only by a crystal-studded skull motif on one of the walls and the colourful weaved baskets used to contain nachos and the bill. Sitting at the ‘ceviche bar’ gives you the best view of the house – that of the u-shaped kitchen staffed by at least eight Spanish speaking chefs. The black-uniformed waiters were friendly, informative and efficient, although I didn’t know where to look when it came to the receptionists’ plunging necklines. Despite the relatively high prices and moneyed Mayfair location, the menu at Peyote is surprisingly traditional consisting mostly of tacos, tostadas, ceviches and quesadillas as well as ‘laminados’ – a vaguely South American and contemporary take on sashimi as far as I can tell. 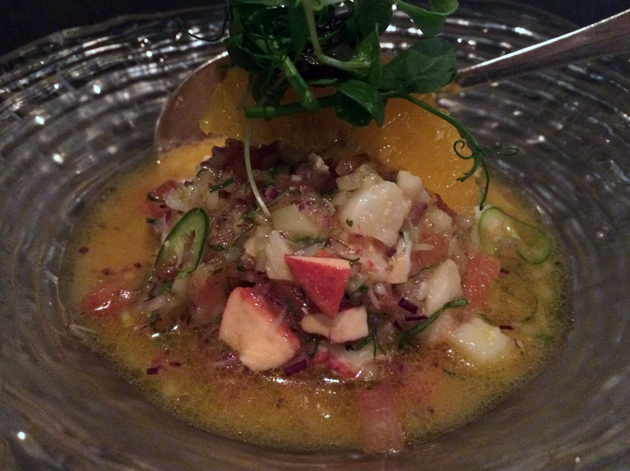 Although tender, the small bitty pieces of flesh in the lobster ceviche made it hard to appreciate the crustacean’s texture. The small pieces of cactus and the light and fruity orange-ish brine did little to improve matters. If it wasn’t for the moreish salsa served on the side, possibly made from a mixture of tomatoes and turtle beans, this dish would have been utterly forgettable. The tacos were better, despite the middling corn flour tortillas. While surprisingly thin and clearly hand-made with rough, uneven edges, they also lacked the nuttiness I normally associate with corn flour tortillas and therefore ultimately tasted rather bland. 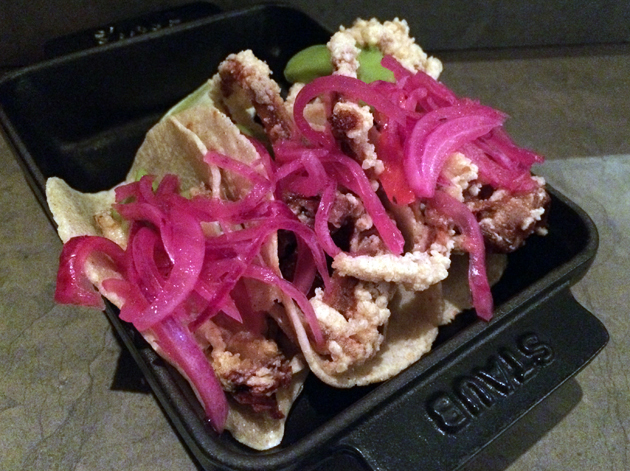 The soft shell crab tacos consisted of fresh, salty, zingy pieces of crustacean in a light and moderately crispy batter, although the topping of pickled veg left me unmoved. The facade of Peyote couldn’t be more unwelcoming – stark white, shuttered windows and a small brass nameplate. 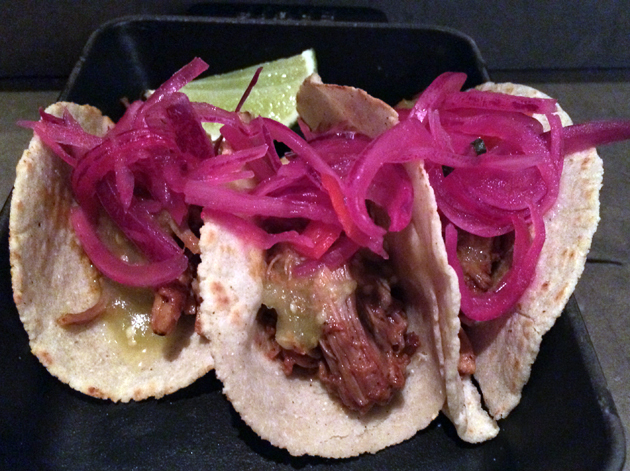 The tender meaty strands in the pork pibil tacos lacked the citrusy hints I was expecting and the same unremarkable pickled veg made a repeat appearance. 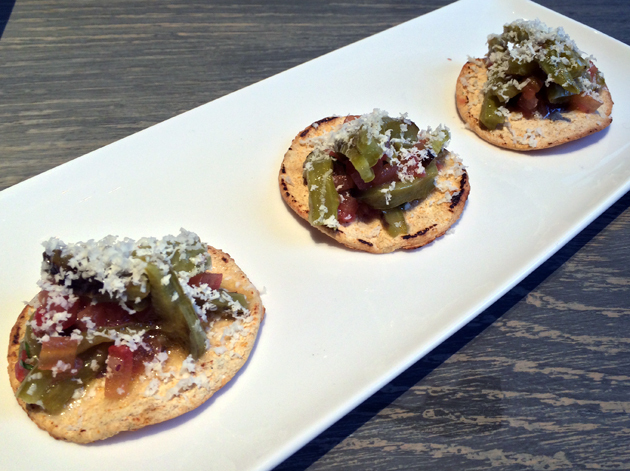 The pork was complimented well though by the lightly tangy and spicy green chilli-based salsa served on the side. The savoury highlight of my dinner wasn’t the tacos however, but the sea bass. The fish had been expertly cooked just to the point of being slightly done, leaving the salty, light and tender yet meaty flesh lip-smackingly zingy. The thin coriander and pineapple sauce was oddly reminiscent of a lemon curd due to its sweetness and tartness, but this was all rather weak and tended to drown out the excellent bass when smeared over it. 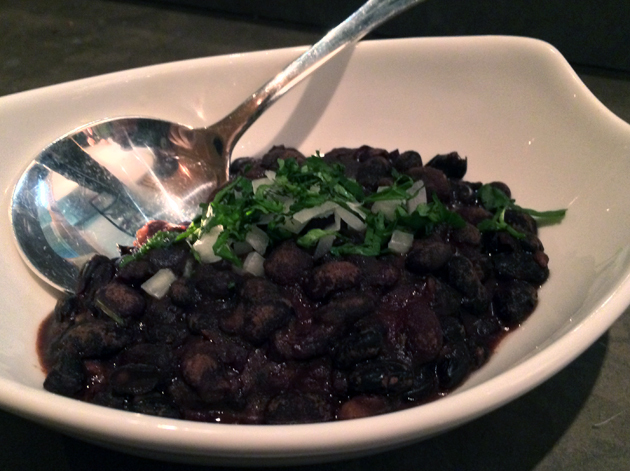 A side dish of black turtle beans was tender and not too stodgy, but also rather bland. The chocolate sauce accompanying the churros was a bit sweet and tangy and complimented the deep fried dough sticks well enough although it was, in of itself, ultimately unremarkable. 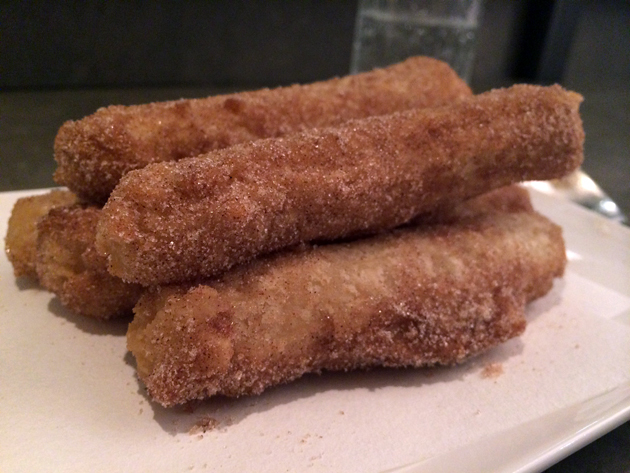 The sticks of churros themselves had an excellent, well-crafted texture – free of excess oil with a light, crisp bite and a fluffy interior. The upstairs dining room at Peyote is more colourfully decorated than the downstairs with some brightly painted skulls in particular catching the eye. Although the receptionists’ plunging necklines were unchanged, the quality of the table service was very different and not in a good way. The frenetic but ineffective waiter took 25 minutes to take my order – an unacceptable delay that was made all the more humiliating when he showed more interest in picking detritus off the floor and in taking yet another drinks order from the neighbouring table of drunken socialites. A second delay of 10 minutes to take my dessert order wasn’t as long, but no less infuriating. I double checked my cloaking device, but nope it was off. Incompetence it is then. I’m not really a fan of tostadas, but I decided to give the cactus tostada a chance – especially as the inexcusable service delay didn’t leave me with enough time to try one of the bigger main courses which take a little longer to prepare judging from my last visit. I was unimpressed with the bland and stodgy crunchy corn tortillas. The slices of cactus were pleasingly juicy, sweet and firm though and complimented well by a smearing of crushed beans and some tomatoes. Still not a fan of tostadas. 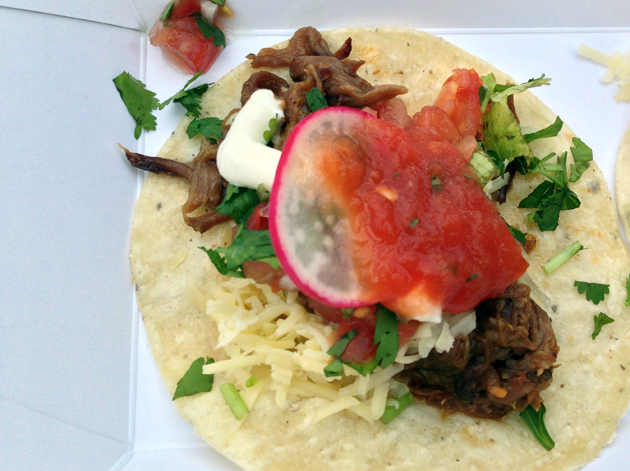 The tacos used far better corn tortillas compared to last time – thicker, fluffier and nuttier. The mushroom tacos were filled with slightly earthy and tender pieces of funghi, but a more unusual choice were the avocado tempura tacos. 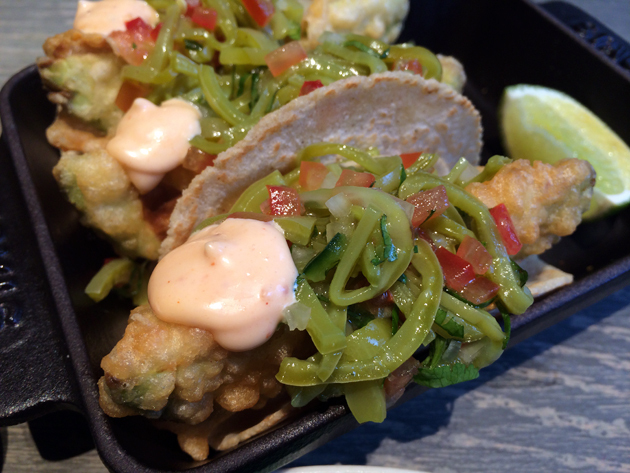 Although it sounded unusual and promising, the avocado tempura tacos were ultimately disappointing. The thick and slightly stodgy batter gave way to a hot and momentarily fluffy but very bland avocado filling. The only smidgin of flavour came from the shavings of sweet, juicy cactus. Sozzled debutantes may be impressed, but I am not. 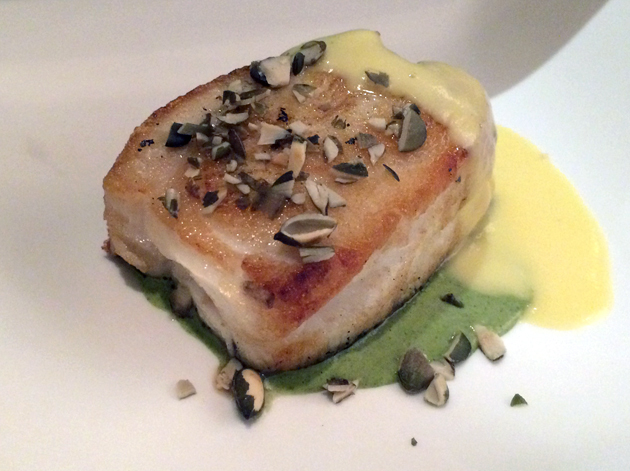 The only highlight of this meal was, surprisingly, the yellow tail laminados. 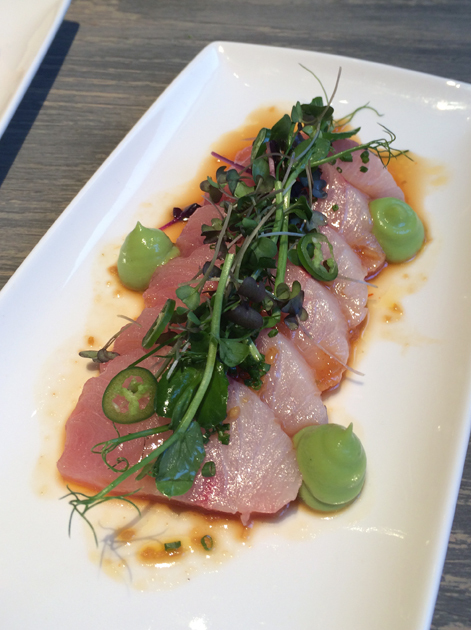 The thin slices of firm, meaty yet light fish were served in a soy sauce that wasn’t too salty along with a few choice dollops of smooth and surprisingly complimentary guacamole. Perhaps I was sitting in an architectural blind spot? Nope. Incompetence it is. 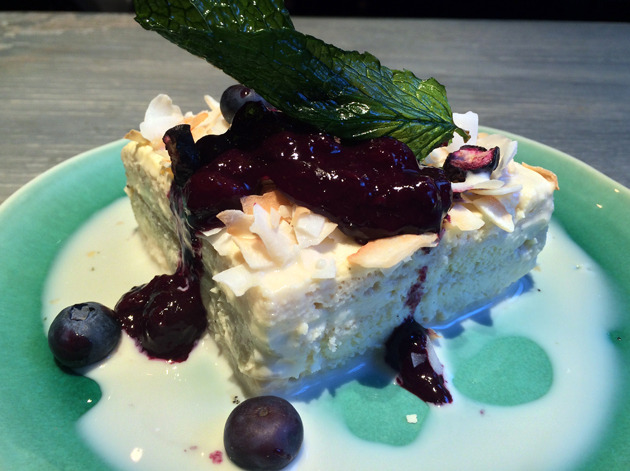 Things returned to their depressingly unimpressive form with the tres leches cake. Although large and fluffy, what should’ve been a rich and flavoursome cake was flat and bland. Needless and tasteless blueberry compote. Breddo’s may be just a taco stand, but the quality of their corn flour tortillas is very consistent – thin, but very nutty and fluffy. The fillings haven’t been overlooked either – the braised beef short rib is particularly good. Dense, earthy strands of beef were complimented nicely by shavings of fresh coriander and thick, gently sharp sour cream. The first taco I’ve had where the sour cream actually makes sense. Just as good was the fried chicken with raspberry hot sauce. Although this sounds bizarre, it was utterly delightful. The chunk of fried chicken was firm, moist, crunchy, free of excess oil and had a hint of mint to it. The hot sauce was not only fiery but also had the unmistakable sweet sharpness of raspberry to it that was surprisingly complimentary to the chilli heat. The odd but highly effective combination of heat and sweet made the chicken so good that I went back for seconds. Blowing raspberries at the competition. We live in interesting times when a market stall can outcook a glitzy Mayfair restaurant. Awful lunchtime service aside, there were some highlights at Peyote. However, the quality of the cooking was inconsistent and its menu is surprisingly conservative which wastes a prime opportunity to introduce some of Mexico’s lesser known regional dishes, or at least interpretations of them, to a wider audience. Jalisco goat stew, Sonoran tripe soup, the seafood specialities of Veracruz or at least some inventive moles would all have been welcome. The prices aren’t cheap either, especially if you have a big main, making Peyote only fair value at best. 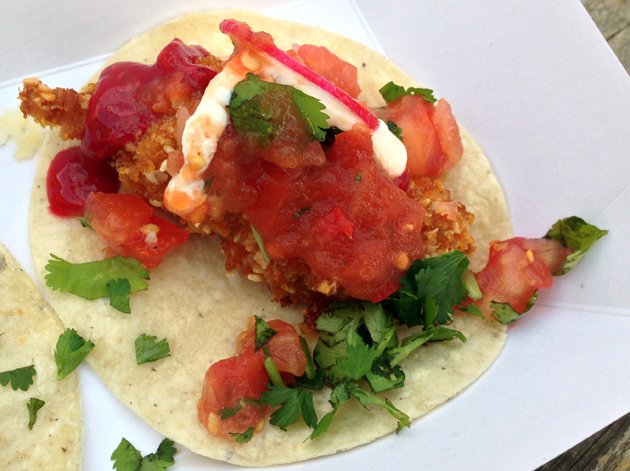 Breddo’s Tacos picks up the inventive taco crown and runs with it. If only Breddo’s would find a permanent home – it could then truly wipe the floor with overpriced socialite hangouts like Peyote. Opening Hours: Monday – Friday noon-14:30 and 18:30-late. Saturday 18:30-late. Reservations: probably a good idea for lunch; highly recommended for dinner. Average cost for one person including soft drinks and service: £50-85 approx. Tags: avocado, beans, beef, breddo's tacos, cactus, ceviche, churros, fried chicken, lobster, london, mushrooms, peyote, pork, raspberry, restaurant, review, sashimi, sea bass, short rib, soft shell crab, taco, tempura, tres leches cake. Bookmark the permalink.